Louisville's Wayne Blackshear shoots against South Florida. TAMPA, Fla. (AP) Russ Smith got poked in the eye and teammate Montrezl Harrell took a blow to the chin, opening a cut. That was as tough as it got for No. 12 Louisville in Wednesday night’s 86-47 rout of cold-shooting South Florida, the fourth straight win for the defending national champions. 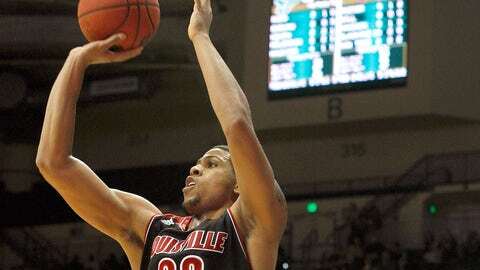 Wayne Blackshear scored 16 points to pace a balanced offense that featured five players in double figures. Harrell and Luke Hancock had 14 points apiece for the Cardinals (17-3, 6-1 American Athletic Conference), who shot 52.2 percent from beyond the 3-point arc and just under 51 percent overall. South Florida (10-9, 1-5) lost to a ranked opponent for the second time in less than a week, shooting just 36 percent from the field. The Bulls, coming off a seven-point loss to AAC leader Cincinnati, turned the ball over 23 times while allowing Louisville to outscore them 35-6 off miscues. Chris Perry led USF with 10 points before fouling out. Victor Rudd was limited to six – nine below his team-leading average – on 3-of-8 shooting. ”This will certainly go down as a game that I want to forget as fast as possible. They dictated, and did whatever they wanted to do. We didn’t have any answers,” USF coach Stan Heath said. Hancock made four 3-pointers. Blackshear went 3 for 4 from behind the arc, and Louisville was 12 of 23 overall. Smith shrugged off being poked in the eye to score 12 points and Mangok Mathiang had 10 to join Blackshear, Hancock and Harrell in double figures. Harrell also grabbed 10 rebounds and blocked two shots. With point guard Anthony Collins sitting out a ninth straight game because of a sore left knee, USF struggled to find any rhythm on offense. The Bulls missed 11 of their first 13 shots and Louisville used an 18-3 run to build an early 22-7 lead. It was 45-22 at halftime, and the closest USF got after the Cardinals scored the first seven points of the second half was 27. Louisville’s biggest lead was 44 with just more than 5 minutes left. USF shot 33 percent in the opening half and only warmed up slightly after the break, finishing 16 of 44 (36.4 percent). The Cardinals have won six of seven since losing at Kentucky on Dec. 28. They improved to 28-4 against USF, including 14-1 under Pitino.